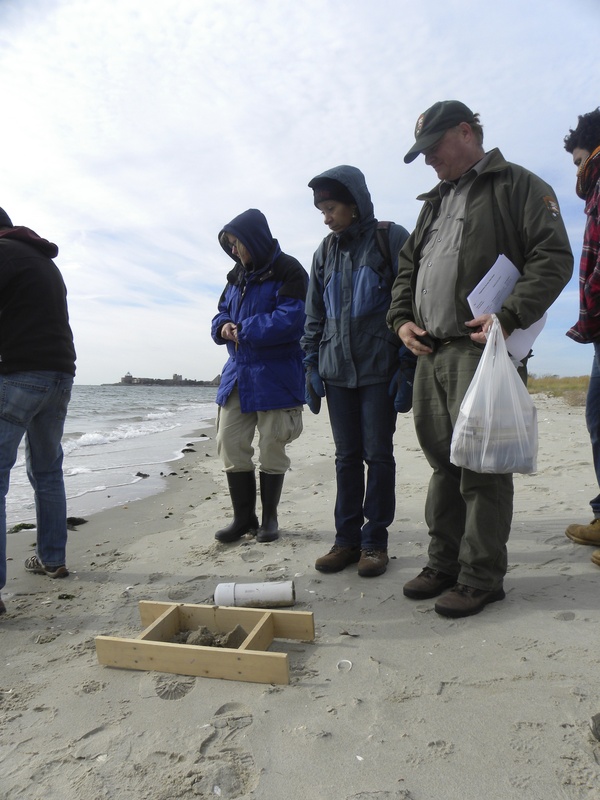 On November 9th the Sentinels of Shoreline Change, which consists of a team of Brooklyn College professors, middle and high school teachers and National Park Service staff- all convened at Plumb Beach in Jamaica Bay for a data collection field trip. It was a windy, gloomy day, but the goals of the Sentinels were clear- to familiarize themselves in data collection techniques and to develop ideas for project-based lesson plans that would incorporate data collection as well as activities with a focus on civic engagement. The long-term plan for the Sentinels is to create a citizen science field observation program to monitor the shoreline of Jamaica Bay for shifts due to climate change and human activity. The Sentinels will ultimately fill the need to detect early warnings of marsh loss, shoreline erosion, the spread of invasive species and other changes to the Bay’s ecosystem.